You’re a PHP developer. I get it. So am I. My journey to PHP didn’t take the normal road that most PHP developers travel in their quest for the perfect programming language. I initially started as Java Developer and spent roughly 10 years living in that land. I was one of those die hard Java developers that when PHP would get introduced into a conversation, I would start spouting off things like enterprise, scalability and other nonsense. I started working on an open source project that needed a social web front-end about 5 years ago and the team needed to choose a programming language for the site. I explored Java and most other languages but settled on PHP for a number of reasons. It was tough to swallow my pride and start coding in PHP but what happened during that project was nothing short of a miracle. I fell in love with the language and began using it for as many projects that I could find while leaving my Java roots in the dust. PHP has served me well over the last 5 years but I was still searching for that holy grail of a programming language that is fast to develop in, has enterprise backing, is performant and scalable while also providing a strong community of developers. I believe that Node.js satisfies all of my requirements while still being a fast growing and evolving language. The first thing you need to understand is that Node.js is not just for the hipster developers or early adopters. It is in use by some of the most highly trafficked website on the Internet today and is continuing to win over developers hearts and mind. It is truly at a point where you can trust it for even the most complicated of systems. Node applications are normally implemented when you need to maximize efficiency by utilizing non-blocking I/O and asynchronous events. One gotcha for PHP Developers to know is that Node.js applications run in a single thread. However, backend Node.js code uses multiple threads for operations such as network and file access. Given this, Node is perfect for applications where a near real-time experience is desired. For the remainder of this blog post, I am going to show you how to get up to speed with Node.js coming from a PHP background. The sample application that we are going to write is a simple backend service that will provide the location of every Walmart store. I chose Walmart for this example because quite simply, it is the holy grail of all department stores. If Walmart doesn’t have it, you don’t need it. By the end of this blog post, you will see how quick and easy it is to create a REST based API using Node.js that is powered by the popular MongoDB database. I chose this REST based example because creating a backend API has quickly became a common use case in most modern applications. I had originally planned to create the same application in both PHP and Node.js to help ease the transition for you but in order to cover all of the different frameworks and ways of creating REST based services in PHP, it would warrant an entire book and simply can’t be covered in a single blog post. I then thought about just using the Laravel framework as it is continuing to grow in popularity. However, I would still only reach a quarter of the PHP developers. 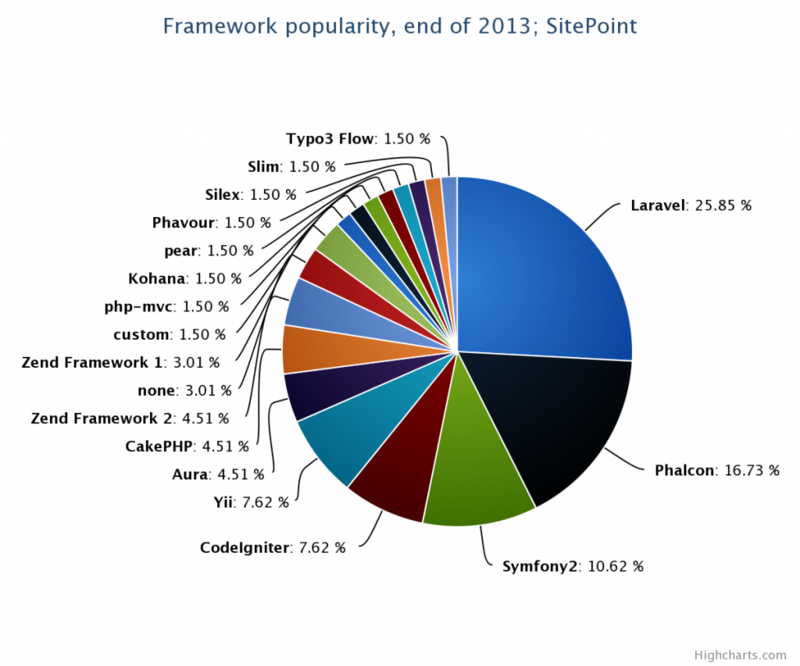 Personally, my favorite framework is CodeIgniter but it is quickly losing ground and now only represents less than 8% of the PHP developer population. Sitepoint recently published an article discussing this very thing and provides the following chart depicting the frameworks that show the most promise for 2014. Given the vast differences in how to configure database connections and create REST services for each framework, I will assume that you know how to do this for your framework in PHP and instead will focus just on the Node.js code. For the rest of this post, we are going to create the Walmart locator application using the LoopBack API framework from StrongLoop. 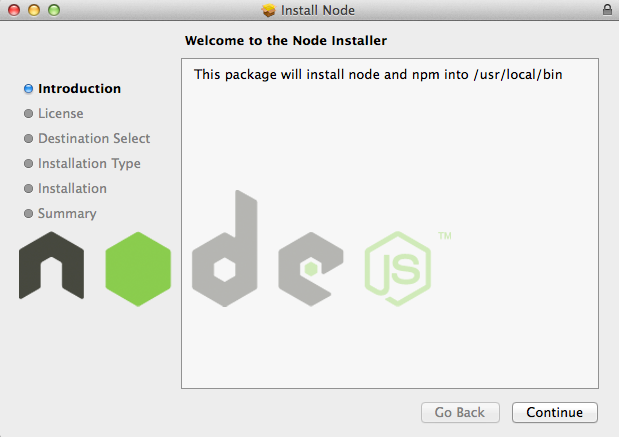 As an added bonus, I will walk you through installing Node.js on OSX. So grab your cup of coffee, sit back, relax, and let’s get to work. Complete the installation process by using all of the defaults and finally click on the close button to exit the program once the installation has been successful. Pretty easy, huh? Now that we have Node.js installed on our local system, we want to install the LoopBack packages that is provided by StrongLoop. LoopBack is an open source API framework that provides functionality that will make your life easier as you begin to learn how to write and deploy software written in Node.js. NPM modules works the same way and uses the package.json file to allow you to specify dependencies for a particular application. You can also install dependencies from the command line to make them available on your local system. Don’t worry if you don’t understand this just yet as we will cover the package.json file in more detail in a later step. What just happened? We told npm that we want to install the strongloop package while also providing the -g option. The -g option makes the package available as a global package for anyone on the system to use and is available to all applications. Once you run the above command, NPM will download the package as well as any dependencies that is required. Depending on the speed of your system, this may take a few minutes to complete. 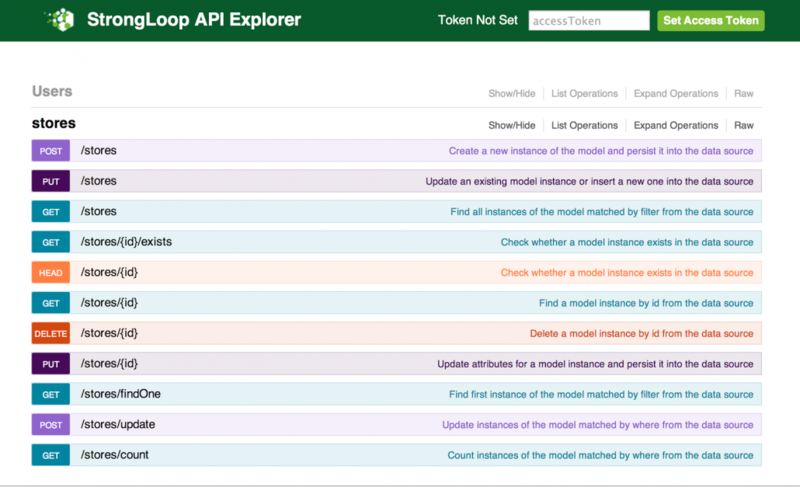 Creating an application using the LoopBack API is very easy and straight-forward. Simply open up your terminal window and issue the following command to create a new application called locatewalmart. The slc utility will now create a new LoopBack based project called locatewalmart and configure the project. When we get prompted for the application name, we can keep the default. Now that we have our application created, we want to add support for MongoDB as a datasource for loopback. Note: Be sure to provide the correct connection URL for your MongoDB database. For this example, I have a database created locally called locatewalmart that I want to use for my datasource. Now that we have our database defined, there are a couple of extra things we need to do. First of all we need to specify that our applications depends on the loopback-connector-mongodb package. To specify a dependency, you modify the package.json file which is similar to editing the composer.json file in PHP. Open up the package.json file that is located in the root directory of your application and add the loopback-connector-mongodb to the dependency section. After that you can run npm install. Now that we have our datasource configured, we need to load the data set into our MongoDB database. This will begin an interactive session where you can define your model. The first thing that you will be asked is the datasource you want to associate the model with. We will select the mymongo datasource that we just created before. Next it will ask for the plural name for the model. Let’s use the default (stores) and press enter. Once you hit the enter key, you will be prompted to specify the properties of store model. You can think of this as var(s) that you define on a class in PHP. The properties we want to add is the type of store, the open date, the latitude and the longitude. Once you hit enter, you will be asked to provide the data type for each property specified. The first item will be opendate and we want to select that it is of type date. Select date and press the enter key. Then you will be asked if you want this property as a required one for schema validation. We will enter “yes”. Let's add another store property. Type in “yes” and hit the enter key. As you can see, we have a model created and the properties we defined are assigned to the store model. The public field specifies that we want to expose this model to the world via a REST web service. 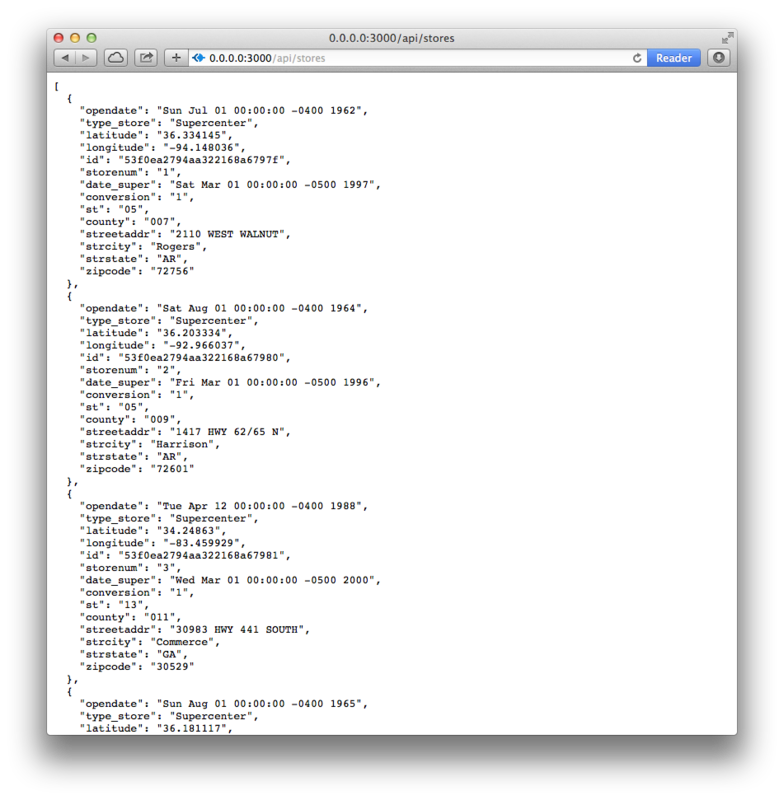 The mapping of the model to the datasource is defined in the model-config.json under the app root/server folder. 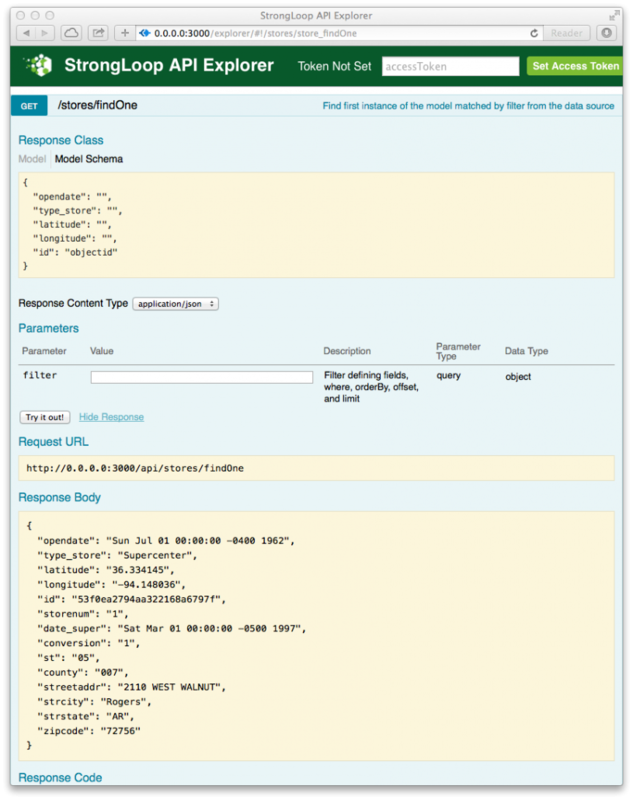 The datasource field specifies the datasource that this model will use for CRUD operations. 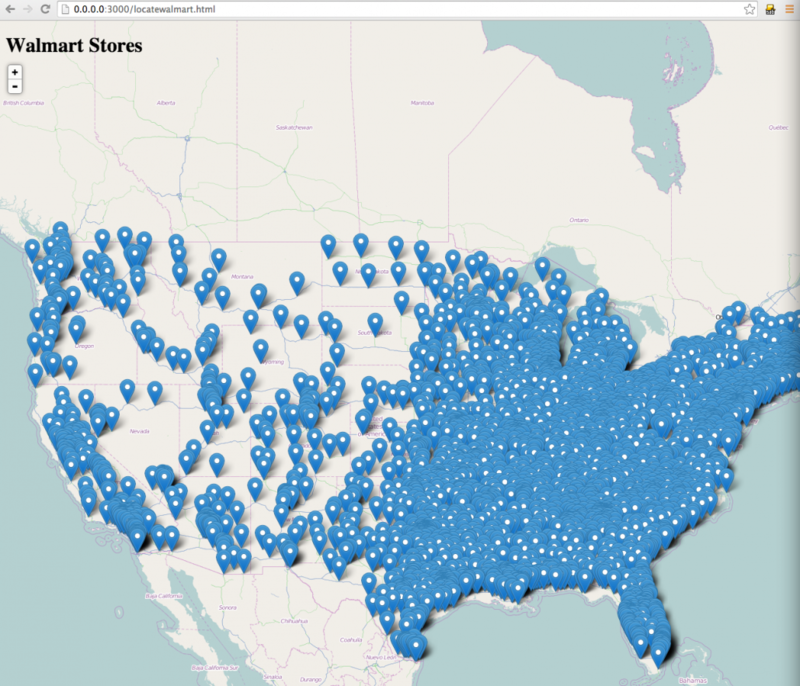 Awesome, we have a created a REST based endpoint that will return a list of all of the Walmart stores in our database. 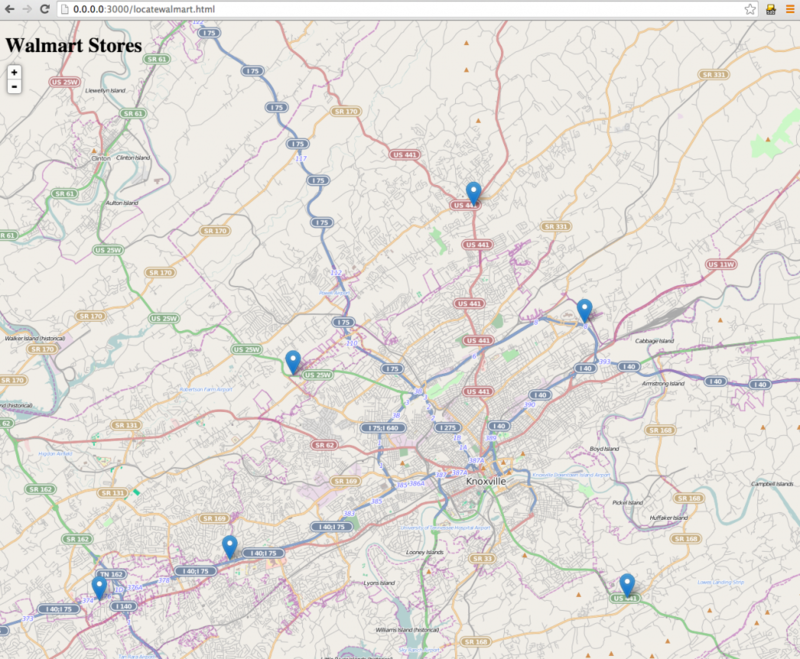 To further illustrate the speed with which one can develop full applications with StrongLoop, let’s build a responsive front end that contains a map with pins for every Walmart store. The code for the web view of the application takes advantage of the longitude and latitude properties that we defined on our model object and imported into the database. We will also use the popular Leaflet library for creating the map and placing the pins, or markers, on the map. In this blog post I showed you how to create a REST based web service that returns a list of Walmart stores in the United States. After we created the web service using Loopback, we added a front end representation of the data. With very little work, we were able to develop a fully functioning application much faster than one might be able to with their current language of choice. We also discussed some of the similarities between Node.js and PHP. While I still consider PHP to be a great language, I have personally found that Node.js makes a great next language to learn given the rich ecosystem of libraries and speed with which I am able to create applications. 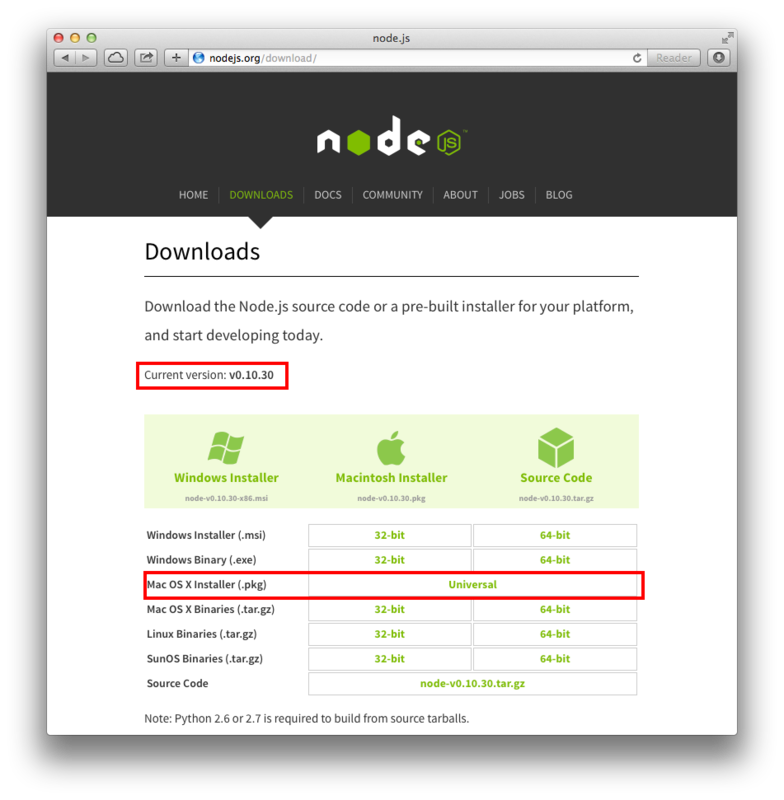 I have included a quick table that you can reference when comparing Node.js with PHP. Yes, with additional processes such as Apache WebSocket etc.